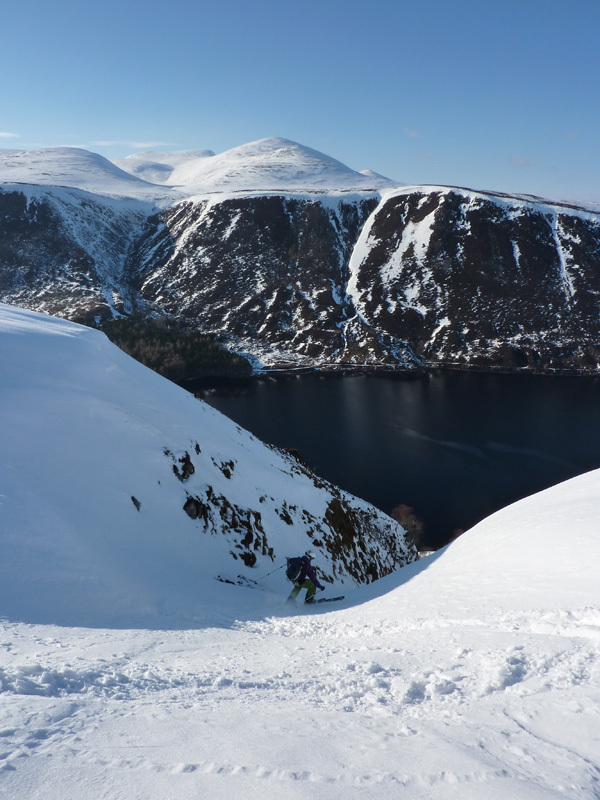 The slopes above Loch Muick may not be the first to feature in the thoughts of where to go for gully skiing in Scotland, but the nature of the terrain means that under certain conditions, they can provide some fun. 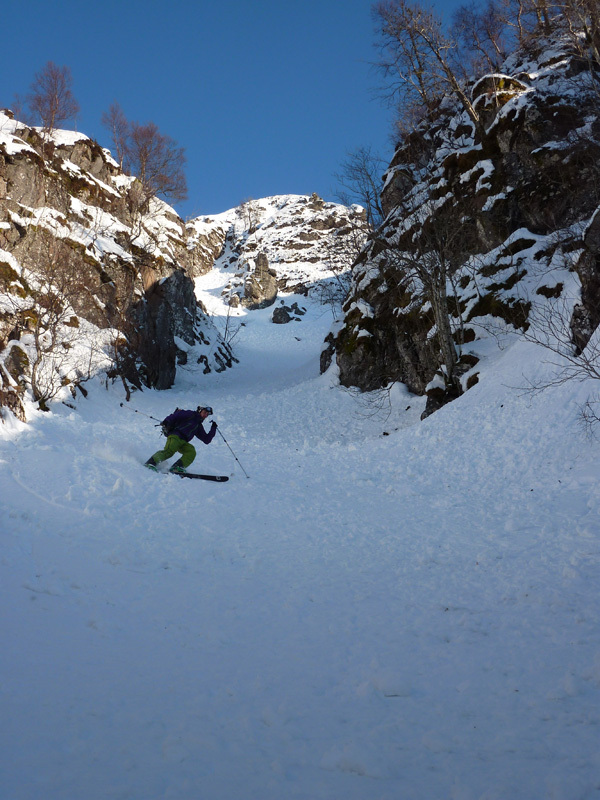 With the tops of the runs around the 600-650m mark, these may be an option when conditions are too wild higher up the mountain, or you might take one of the lines in on return from either the Dubh Loch or Lochnagar. There are various aspects to choose from, depending upon snow conditions. 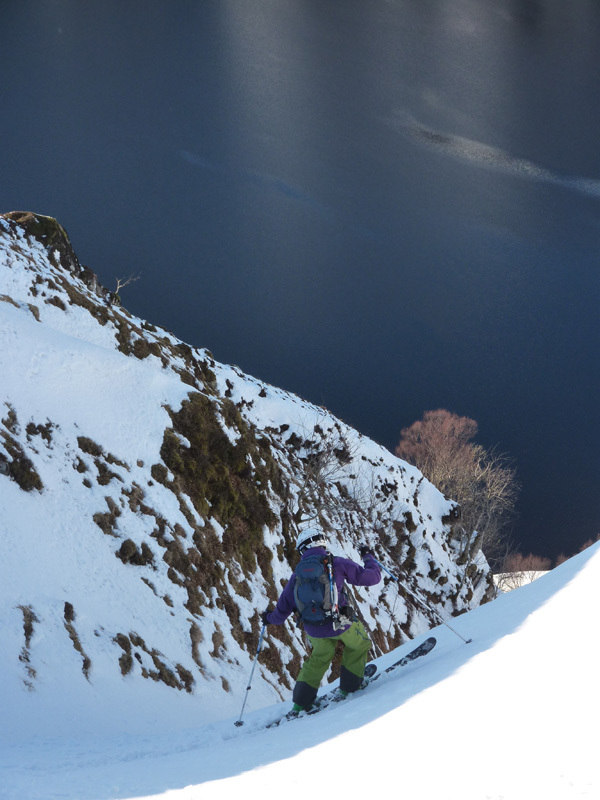 Skiing above the loch is an enjoyable and memorable experience. The most sensible location for access is the Spittal of Glenmuick. It is possible that when the slopes are good enough to ski, the access along the road could be problematic. A bike could be used to get to Glas-allt-Shiel, which is handy anyway for the Dubh Loch, for example, but if you want to get a few lines done in above the loch, I would just walk/skin to maintain flexibility. The 2 obvious gully lines on the NW facing slope opposite the Glas-allt-Shiel are described here, but there are potentially a lot of shallow skiable gully lines. 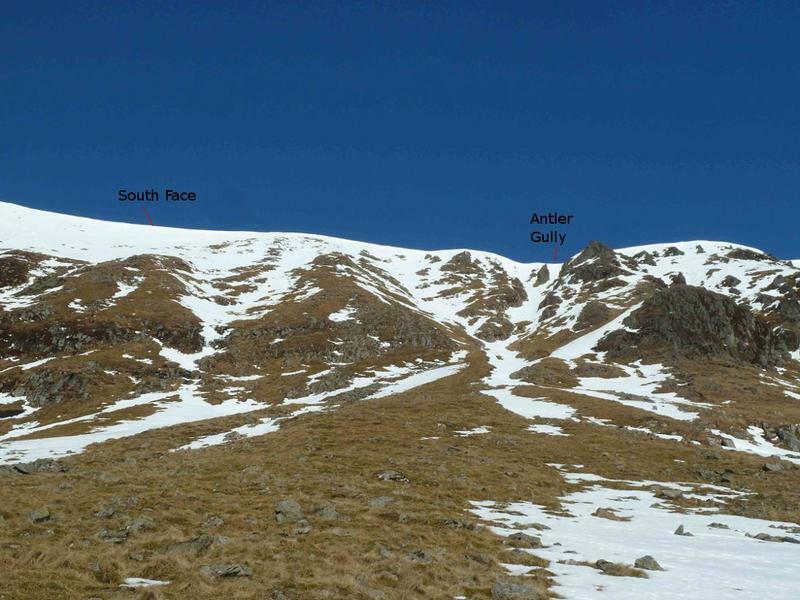 Several options are obvious on the east facing slope below An t-Sròn (710m), and along the slope above the land rover track to the Glas-allt-Shiel that could be taken in on a return from skiing on Lochnagar. Creag Bhiòrach on the south side of the loch also has a short steep gully splitting the craggy ground, along with some more mellow options each side of it. 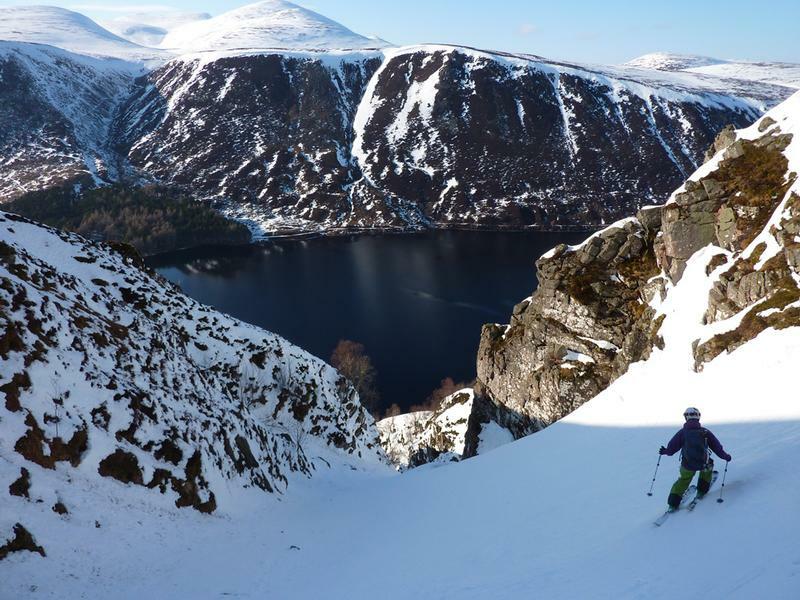 There is one relevant Scottish Avalanche Information Service forecast for Loch Muick Basin. This is the wide corridor that descends from the plateau facing the Glas-allt-Shiel directly to the loch. It is pronounced "Roch Grip", and means "Rough Channel", which is quite an accurate description! 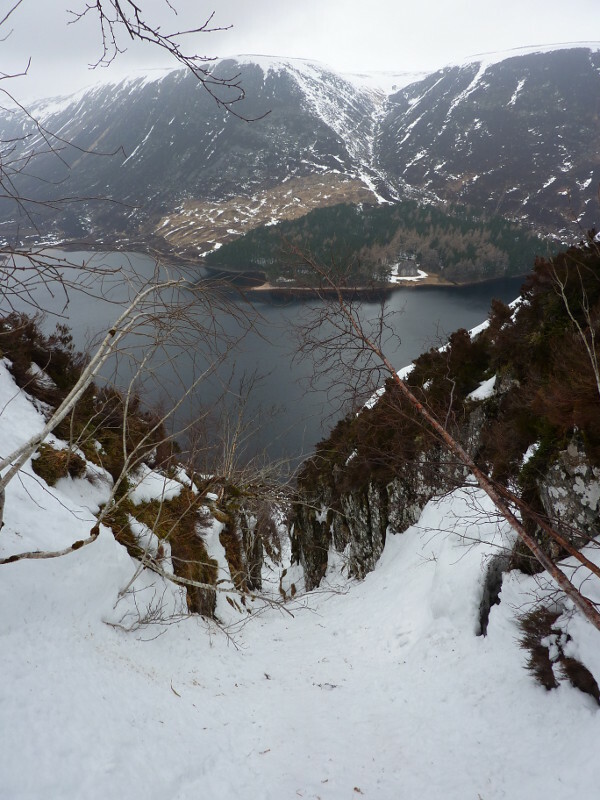 The gully starts from a kink in the landrover track that runs along the edge of the slope above the loch. There's a little steepening just before the gully changes direction, before it becomes a straight corridor all the way to the loch. 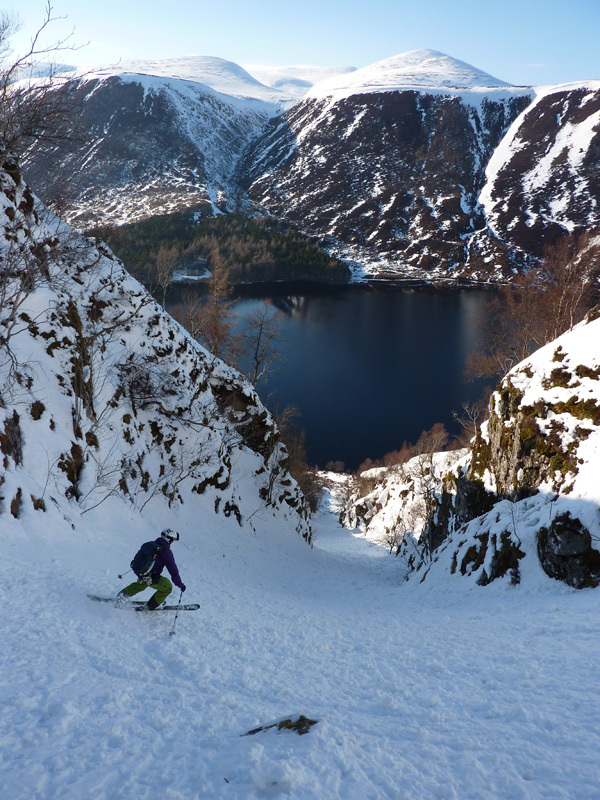 If you were only to ever ski one low level gully around Loch Muick, then I recommend that you make it this one! In contrast to it's wide neighbour, "The Chimney" is an altogether completely different prospect. If you like gully lines that in the most part are too narrow to even jump turn, with rock walls to bounce off if you do, and full of trees to get tangled in and smack you in the face, then this is the line for you! It's more a game of pinball than skiing. However, it's a great looking line, in a great position. You may even have an audience at the Glas-allt-Shiel watching your foolish endeavours as you attempt to make it down intact. When it is full of snow, be aware of loaded slopes above it. 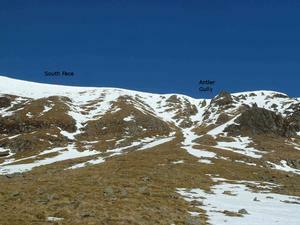 The easiest entry may be on the skiers right, and cut back into the line of the gully.